Fred Webb meets up with his friends at McDonald's every week, and celebrated his athletic achievements by bringing 96 cookies to this special group of pals. KNOXVILLE, Tenn. — There are two key ingredients to living a long life that 96-year-old Fred Webb wants you to know about. "Cycling and chicken nuggets," he tells 10News. This World War II veteran rides 10 miles on his stationary bike three days per week, and just hit the 70,000 mile mark. It only took him 45 years to accomplish. Fred Webb, 96, celebrated 70,000 miles on his stationary bike by bringing his friends cookies at McDonald's. "I technically did it yesterday, but I left the last two-tenths of a mile so [my family] could see the numbers tick over," Webb said. His daughter, Cheryl Roach, said Webb is an eccentric man and meticulous about his health. Her dad treats himself in a big way, though, when it comes to his almost daily rendezvous with the McDonald's over on Broadway Avenue. 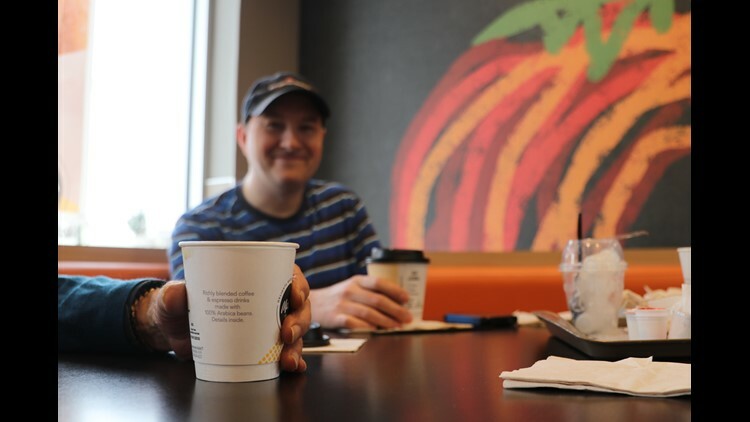 The 'McDonald's Squad' has been meeting to discuss life, news, and politics at the McDonald's on Broadway Avenue for about twenty years. That's where Webb meets up with a lively squad of pals - a group of men and women that ranges from lottery winners to Korean War veterans to immigrants - who have been meeting up together for close to twenty years. Squad member Skip Lawrence said they come from all walks of life, and only met through their shared affinity for the golden arches. "It started off just with a smaller group of people and other transients started coming in, just joining the group," Lawrence said. "We enjoy each other's company. Being able to discuss things without being riotous about it." This brotherhood is close, but never cliquish. "Anyone's invited," Lawrence said. "We go from impoverished to incredibly wealthy." It's this group of friends who Webb chose to celebrate his accomplishments with. On Thursday, 10 of them showed up as he unveiled a massive basket of cookies. His daughter and granddaughter helped inscribe the cookies with "70" in red icing - tributes to his age and the miles he rode - for him to share with the friends. "Honestly, it's a fellowship", Lawrence said. So sure, chicken nuggets and cycling may very well be the key ingredients to living a long life. But a squad of pals who rally at McDonald's when you hit 70,000 miles on your stationary bike doesn't hurt either.